The BMW M1 is the most awesome and supercar-y BMW ever built (I guess the 507 would count too, but its sporting intentions don’t quite match those of this car. And it was built in the pre-modern supercar era). It is the only mid-engined BMW built in quantities to this point. In fact, it is so revered that when BMW’s M-Power in-house tuning division created their version of the 1-Series, BMW forwent their conventional naming system that would have pegged the car as the “M1” and went with the obtuse “1 Series M Coupe” instead. It’s nice to see a company value their legacy so much. This car is one of 456 hand-built by BMW between 1978 and 1981. There were competition versions and art cars, but the road-going M1 is a thing to behold. It uses a mid-mounted 3.5-liter straight six making 273 horsepower – which doesn’t sound like a lot now, but this was 1980 when big-power engines were being choked out of existence. It could do 160 mph. 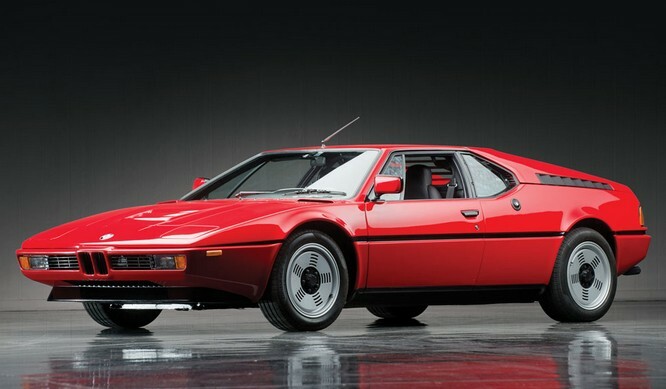 The M1 was the first serious performance car built by BMW. It retained halo status for some time and has never really been equaled (the Z8, maybe). They’ve always been valuable and sought after. This one is expected to bring between $150,000-$250,000. Click here for more info and here for more from the Don Davis Collection. This entry was posted in Uncategorized and tagged 1980, auctions, BMW, cars, classic cars, m1, rm auctions, sports cars by classiccarweekly. Bookmark the permalink.